Alexander Hamilton may have been “young, scrappy and hungry” as described by Lin-Manuel Miranda in the Broadway musical, but he also had “hella good hair,” to quote another song completely out of context. 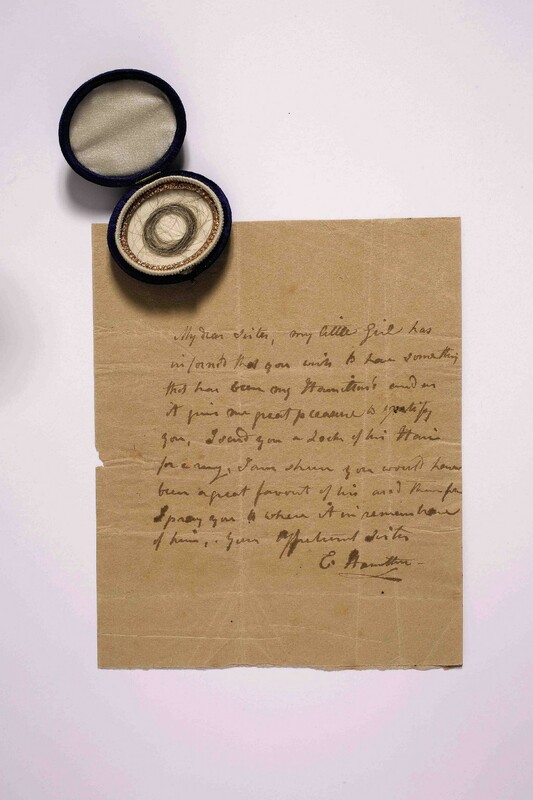 A tiny, coiled lock of that hair, preserved in a blue velvet locket case, will be offered at auction in New York on January 18, for an estimated $15,000–25,000. You hear the name Oskar Schindler and immediately think Liam Neeson. Fair enough. In the film Schindler’s List (1993), which won seven Academy Awards, Neeson portrayed the famous German industrialist who saved the lives of about 1,200 Jews during the Holocaust. He thus became a household name. So it’s unsurprising that Schindler’s stuff would appear on the market. In 2013, documents related to his Krakow factory sold for $122,000, and one of his original typed “lists” surfaced on eBay, but the $3-million opening bid was too steep for any buyer. This upcoming lot, which goes to auction in Edinburgh on January 11, is a little different. 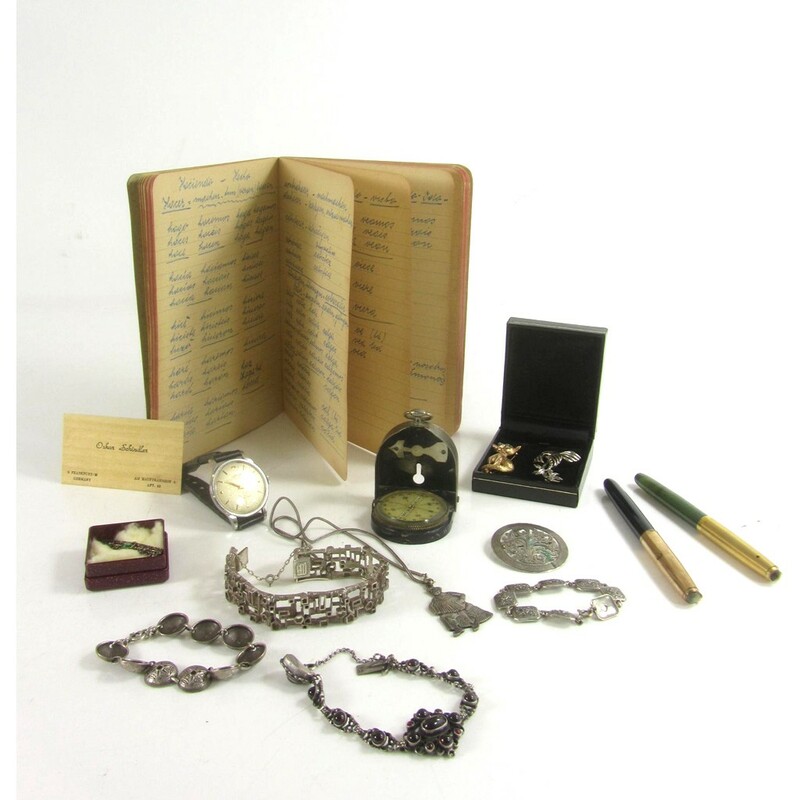 It contains small, personal items that belonged to Schindler and his wife, as if someone dumped out the contents of their bric-a-brac drawer: a wooden business card bearing Schindler’s name and a Frankfurt address, a notebook of German-Spanish translations, a compass said to have been used by the couple while fleeing Russian troops in 1945; two pens; and miscellaneous jewelry, including a watch, four bracelets, four brooches, and a necklace. The winning bidder — dear God let him/her be a decent human with good intentions — may secure this strangely intimate assemblage for about £2,000 ($2,500). Among the golden nuggets and antique poker chips to be sold at auction on January 19 in Las Vegas (natch), there are two items that simply must be paired for some real old-timey frontier fun. First up: A mostly full (lightly sipped?) bottle of Custer’s Reserve Whiskey. The back bar bottle depicts the handsome general on horseback, c. 1895. Custer was long dead by then; this “extremely rare” bottle of spirits memorializes the … cough … American hero. With a $10,000 buy-in though, will the winner drink it? Hell, yes. How else would one prepare to pony up $100,000–200,000 for a Bowie knife later in the day? While there are several dozen knives on offer, one sticks out: a ten-inch blade given by Rezin Bowie, brother of the weapon’s designer, to his friend, Edwin Forrest, a Shakespearean actor from Philadelphia, sometime around 1835. That dramatic provenance “should be of great interest to historians, museums, and militaria enthusiasts worldwide,” according to the auction house.